Thousands of people crowded the Palang Pintu XIII Festival (a door-bolting tradition) today that will be held until Sunday (5/6) tomorrow on Jalan Kemang Raya, Mampang Prapatan, South Jakarta.
" This is good for children"
The festival that officially opened by South Jakarta Mayor, Tri Kurniadi is enlivened by Betawi and Bazar. Based on beritajakarta.id, the visitors who attended this festival brought their relatives and families. They also seemed enthusiastic watching the entertainment presented, ranging from Sutatman (35), a citizen of Mampang Prapatan who invites his wife and son to watch the festival. "This is good for children, we can introduce Betawi culture, let my child know," he expressed, Saturday (5/5). At the same time, Siti Rukoyah (40), a citizen of Jalan Bangka admitted, every year, she always taking her son and son to this festival. "I am happy to see Betawi culture can be preserved like this by the young generation," she stated. In the festival, the event organizers provided two main stages consisting of a stage for art and cultural performances, as well as entertainment stage. 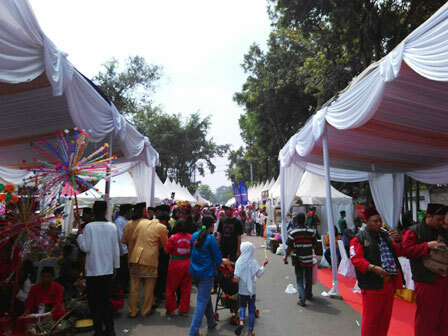 The visitors are not only watching the festival, but also can shop and try out various culinary Betawi.